Just re done the nursery and bedroom for my grandsons and love my choice. 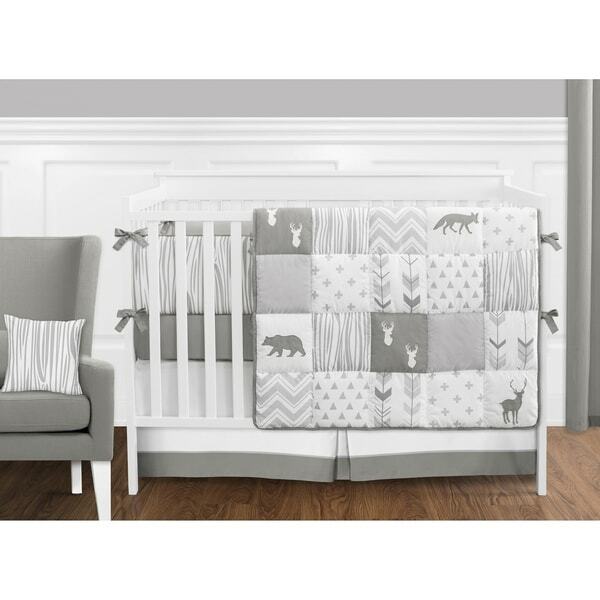 Grey and White Woodsy 9 pc Crib Bedding set has all that your little bundle of joy will need. Let the little one in your home settle down to sleep in this incredible nursery set. This unisex baby bedding set features an impressive array of exclusive fabrics combining arrow, wood grain, chevron and geometric prints. This collection uses the stylish colors of dark grey, light grey and white. The design uses brushed microfiber and 100% cotton fabrics that are machine washable for easy care. This wonderful set will fit most standard cribs and toddler beds. Crib set includes: Crib Comforter, Crib Bumper, Fitted Sheet, Crib Skirt (Dust Ruffle), Diaper Stacker, Toy Bag, Decorative Pillow and 2 Window Valances.